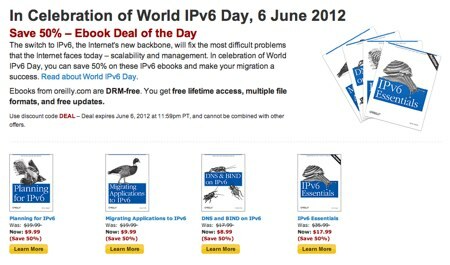 In honor of World IPv6 Launch, taking place today, June 6, 2012, O’Reilly has a deal running for 50% off the price of IPv6 ebooks. NOTE: The deal expires at 11:59pm US Pacific time tonight! So you only have about 10.25 hours left to make the purchase! As I’ve mentioned previously, I’m a big fan of purchasing directly from O’Reilly because in doing so you get into their update notification program. Anytime an author has updates, you get a notification and can easily download a new version. Given that I expect IPv6 application migration to continue to evolve as we get more IPv6 availability, I’ll undoubtedly be making further updates… and by buying from O’Reilly you’ll get notified! 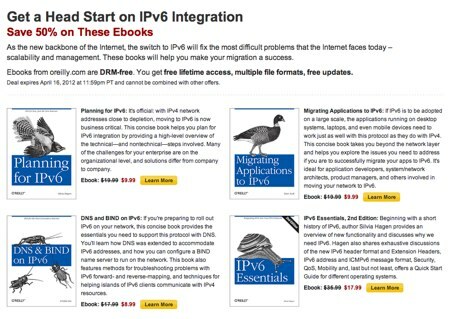 PLUS… all O’Reilly books are DRM-free, a topic I’ve ranted about on other sites! If you use the Amazon Kindle Fire to read ebooks, the folks at O’Reilly have now optimized all their ebooks to work with the new “KF8” format used by the Kindle Fire. When you login to your Oreilly.com account and look at your purchased ebooks (or if you buy the book from O’Reilly), the “Mobi” file there is now a KF8 file that you can download to your computer and upload to your Kindle Fire (or any other Kindle). Now, I don’t know that I’ve necessarily done anything to the text of “Migrating Applications to IPv6” that would strongly benefit from the new KF8 format (nor do I have one to try it on), but these regenerated Mobi files may in fact display better now on the Kindle Fire. Regardless, it’s great to know that the publisher of the book is looking at what can be done to make the books work better on newer devices. The world of ebook publishing is at a fascinating place right now… and given some of the experiments O’Reilly is doing I’m looking forward to writing more of these updates as we all collectively continue to evolve this thing-formerly-known-as-a-book! 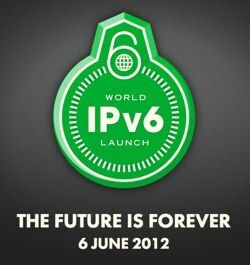 World IPv6 Launch Coming On June 6, 2012 – Will Your Apps Work with IPv6? On June 6, 2012, World IPv6 Launch will mark the time when IPv6 is permanently enabled by many operators, website operators, content providers and organizations around the world. Will your application(s) work on IPv6? What will you need to do to make sure that your apps work as well on IPv6 as on IPv4? The main point of the book was to help you think through the questions and look at what you need to do. I’ll be honest and say I’m not 100% sure yet what I’m going to do with that page, but I’m thinking that I’ll experiment with it as an adjunct to this blog for communication with readers and others about the book. It is also quite frankly a way to experiment with the new “Google+ Pages” that were released yesterday. If you’d like to join me in the experimentation, please do so! P.S. And naturally I have my own (Dan York) regular profile on Google+. Please do feel free to add me to one of your circles. After moving through a job change and reaching a steady state with a family medical issue, I’ve finally got some cycles ahead of me to get back to something I’ve wanted to do for several months now… get an update out to this book! Add a few more graphics to illustrate points, particularly the “happy eyeballs” concept. Expand coverage of the “privacy address” issue. Expand on the issues around Carrier-Grade / Large-Scale NAT. Add in some of the lessons from World IPv6 Day on June 8th. Add examples / case studies from people who have gone through the migration of their app over to IPv6. On this final point, I have a few developers who I am contacting to see if they are willing to share their story, but I am definitely open to including more case studies. 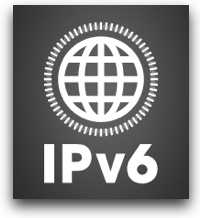 If you have migrated one of your applications to work on IPv6, I’d love to hear from you. Beyond this list, do any of you have other points you would like to see included in the book? Or areas in the book that you would like to see expanded? Please either leave a comment here or drop me an email to let me know. Thanks! I’m not sure of the exact timeframe but I’m hoping to get an update out by the end of November. P.S. Note that any of you who bought the ebook directly from O’Reilly will be automatically notified when the new version is published online. 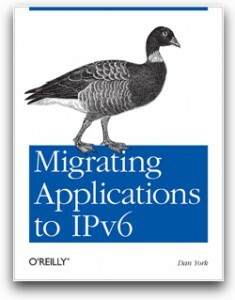 Want to buy the ebook version of Migrating Applications to IPv6 for 50% off? Through September 28, 2011, O’Reilly is running a “Back to School Special” that gets you 50% off the price of all ebooks. All you need to do is go to O’Reilly’s web site and then enter the discount code “B2SDEAL” during the check-out process. DRM-Free – O’Reilly does not use any digital rights management (DRM) software on their ebooks, which means that you can easily transfer your ebook between multiple devices you own as well as keep backups of your book in different places. YOU ARE IN CONTROL! Multiple Formats – Similarly, O’Reilly provides the book in multiple formats so that you can read the ebook on whatever device you want. You can download an ePub version to read on your iPad or other device. You can download a Mobi file to read on a Kindle. Or you can simple download a PDF to read on some other device. Best of all, O’Reilly lets you download all the formats… i.e. you aren’t restricted to just one. Download them all if you want to. Notification of Updates – This is probably the greatest reason to buy from O’Reilly. 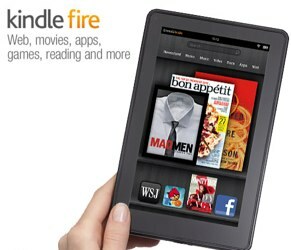 They have a wonderful system to notify you when there are updates to ebooks you have purchased. You get an email with a link and you can just click through to download the new copy. Alternatively, you can visit your product portal on your mobile device and download the new version directly to your device. This last point is key… as I create updates for the book with more IPv6 migration information, you’ll get the notifications directly. Anyway, if you are interested… the sale to get the ebook at 50% off only runs until the 28th! This server has received 4034686 hits from both ipv4 and ipv6.